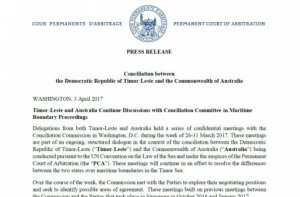 Delegations from both Timor-Leste and Australia held a series of confidential meetings with the Conciliation Commission in Washington, D.C. during the week of 26-31 March 2017. Following these meetings the Conciliation Commission published a Press Release, available here. These Washington meetings come after a round of meetings held by the Conciliation Commission in Singapore, January 2017. More about those meetings and the Joint Statement that was issued at their conclusion can be found here.